Enoch Magazine films a live show in St. Louis and interviews song writer and drummer for Less Than Jake: Vinnie Fiorello. In this interview, Vinnie explains what his job was before he did music, as well as personal hobbies he enjoys. Check out your live performance of Ghosts of you and me. Enoch Magazine had the chance to sit down with Chris and Justin from Saosin. They had a lot to say about the homeless and they even talk about their dreams of being a garbage man. With a love for cowboy boots and rock and roll, Tyler TX band Ivoryline brings a blend of music that speaks for itself with lyrics full of heartfelt compassion. 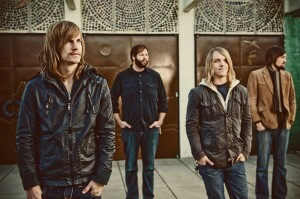 Their break came when they opened for the band Jonezetta. Jonzetta’s former manager loved them so much he passed their demo along to Tooth and Nail. Enoch Magazine travels to Las Vegas to shoot more documentaries. While we were there, we caught up with Dave and Josh from the band Every Avenue. Watch the full interview with Every Avenue from the Take Action Tour in Las Vegas.